Here is a video we created of the Majano Wand killing aiptasia. 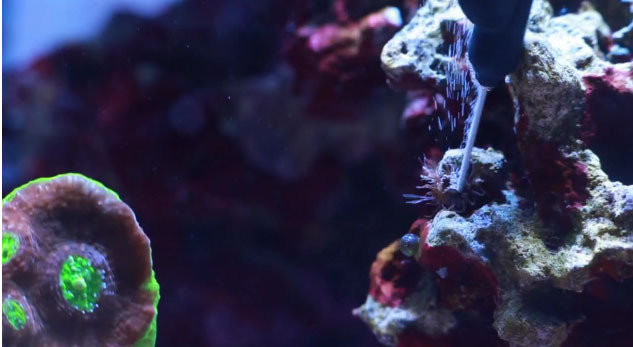 The Majano Wand is designed to irradiate those pest anemones taking over your reef tank. We wanted to make sure it works, so we put it to the test. Here’s a video showing the Majano Wand in action blasting away some pesky little aiptasia. Let us know what you think. Again, we do want to note that the Majano Wand is designed for majanos only, and any application on aiptasia, mushrooms, xenia, etc., is not endorsed. The MRC Orca Pro II protein skimmer from My Reef Creations has become a popular choice for large public aquariums and serious hobbyists alike. The MRC Orca Pro II features MRC’s air aspirator technology and is powered by the Reeflo Dart Gold pump. This particular unit is running on a 400 gallon coral system with only 3 fish! The foam production and the amount of waste processed by the skimmer is impressive considering the lack of fish in the system. I mean, this thing really cranks! The best part: even though the skimmer stands over 3 feet tall, it operates absolutely silently! You know you love hearing this. Nothing better then a skimmer that is an absolute beast, yet is completely silent. EcoTech Marine believes these high-efficiency, high-intensity LEDs represent the best the market has to offer at this point. One of the coolest things about using the Radion, is the EcoSmart Configuration Utility. This neat piece of software allows the hobbyist to create and customize lighting periods with fully adjustable intensity and spectrum. To help hobbyists get going, EcoTech Marine put together this Basic Radion Operation tutorial video. The video begins with a warning, cautioning hobbyists who are switching to LEDs that the switch should be done gradually. We then get to see a tank sporting a Vortech pump, and rocking a wave. The viewer is then informed that plugging the Radion enables “Basic” mode, in which the Radion functions like a “traditional” light, and requires an external timer to control on/off times. This would be the case in situations where you a hobbyist is using anything from an outlet timer, to an aquarium controller. In Basic Mode, the Radion will return to it’s last-set operating intensity and spectrum upon being turned on. The Radion, comes pre-programmed with 7 color temperatures (20K, 18K, 14K, 12K, 10K, 8K, 5K) which correspond to different lighting conditions ranging from clouless sky, to cloudy sky, full sun at noon, and sunrise. Tapping the Cycle button, will begin a cycling of the Radion through it’s present color settings, with each tap selecting the next color temperature (ex. from 20K to 18K, etc.) When the 12K option is selected, you will hear a double beep, indicating that all LEDs will by set to 100%. Start Thunderstorm – to begin a thunderstorm, simply “swipe” across the three buttons from left-to-right, and then tap Raise. The Radion will immediately begin to simulate a thunderstorm, which should just look sick over your reef. Demo Mode– to put the Radion in Demo Mode, swipe across the three buttons from right-to-left, and then tap “lower”. Demo Mode will flash through all the different color settings, then fade from color to color, displaying the full versatility of the Radion. Turn Light Off/On – simply hold “raise,” “lower,” and “cycle” simultaneously in order to turn the lights Off/On while the power source remains plugged in. Increasing/Decreasing Intensity – Each tap of the “raise” button will raise the intensity by 1%. Conversely, each tap of the “lower” button will lower the intensity by 1% (I assume you would have figured this out, but what the heck). You can simply hold down the buttons, for quicker adjustments. There you go, a step-by-step tutorial of the Radion XR30W Basic Mode. Hope you enjoyed it. Two papers published in Global Change Biology, an international journal, reported that coral reefs, are able to both positively and negatively impact the acidity of their surrounding water. The papers, published by scientists from the Australian Institute of Marine Science, the US National Center for Atmospheric Research, and the Centre national de la Recherche Scientifique in France, outline the fact that the actual impact of ocean acidification on coral reefs, is a factor of reef type. As we’ve written about before, the Earth’s oceans are becoming more acidic as the CO2 concentration in our atmosphere increases. This phenomenon is known as “Ocean Acidification,” and is a significant thread to coral reefs, as it reduces the corals ability to maintain structure. “Overall, CO2 enrichment and ocean acidification is bad news for coral reefs”, says Dr Ken Anthony, Research Team Leader for the Climate Change and Ocean Acidification team at AIMS. “But some reef areas take up more CO2 than they produce (through photosynthesis), which can lower the vulnerability of neighboring reef areas to ocean acidification. On the other hand, reef areas with greater coral cover produce more CO2 than they consume (through calcification and respiration) and that adds locally to the ocean acidification threat”. The team remains at work, producing various models designed to explain the way in which ocean acidification risks vary over the scale of the Great Barrier Reef. 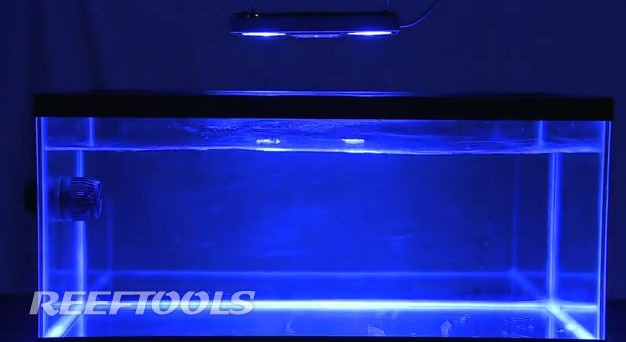 The popular Aqua Illumination SOL Super Blue LED system is now available in black. As a manufacturer of some of the most energy efficient lighting options on the market, Aqua Illumination has become quite popular with hobbyists over the past few years. The SOL is rated for over 50,000 hours, without requiring bulb replacements, making the fixture a smart long-term lighting solution. 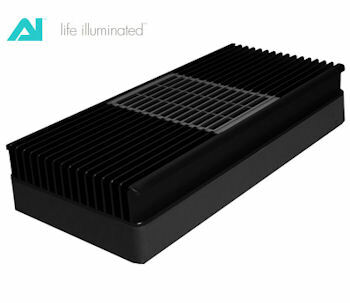 To keep up with the new trends in LED design, AI decided to produce the SOL in a slick black version. The new, black SOL, gives the already streamlined design a cool, aesthetic choice, which some hobbyists may prefer (over the white fixtures). This is an interesting move, with the new fixture from AI (the “Phoenix”) coming soon. What do you think of the new look? You may hare already read about Red Sea’s Reef Care program, designed to enhance coral color and growth. In order to increase the exposure of this new line, Red Sea has created new trial pack versions. The program has four steps, designed to provide a reef system with the “complete solution for: optimal coral health, accelerated coral growth, enhanced coral coloration.” Well…who doesn’t want that? Not ready to buy the real deal yet, well here is where these trial kits come into play. 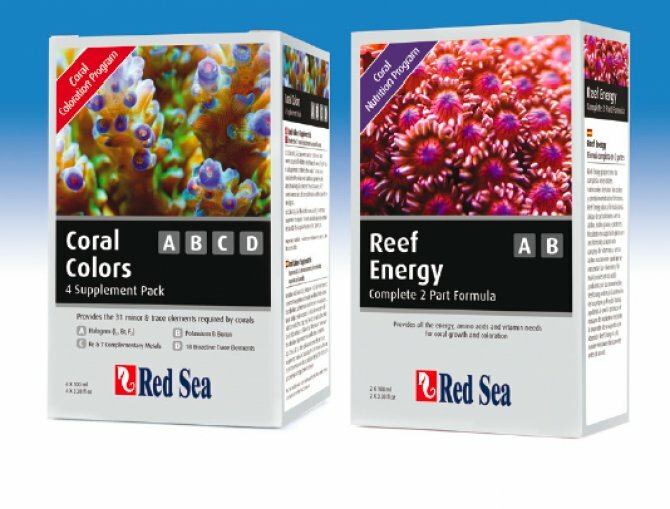 You can now try Reef Energy (A, B), designed for coral nutrition supplementation, in a pack of 2, 100ml bottles. Similarly, the Coral Coloration (A,B,C,D) is available as a 4-pack capable of supporting a 55 gallon (250 liters) SPS aquarium for about 60 days. The Reef Energy program consists of parts A & B, which are said to provide the nutritional needs of all corals and other filter feeders. 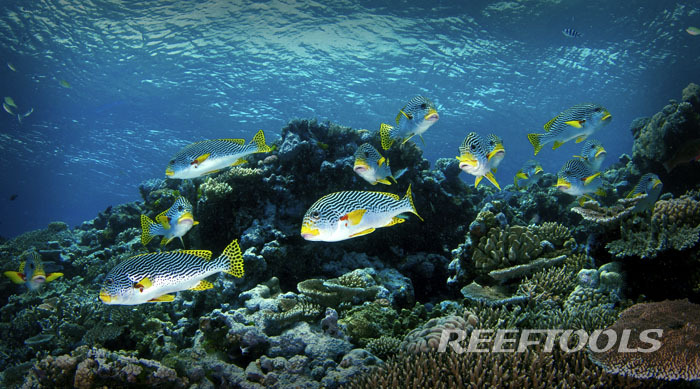 Reef Energy A, consists of a unique formulation of amino acids, fatty acids, carbohydrates and suspended protein flock which are available for direct absorption and consumption by the corals. Reef Energy B, is a very concentrated blend of amino acids and vitamins, the lack of which Red Sea found was a limiting factor in adequately fulfilling the nutritional demands of corals and other invertebrates. Over the years we have been asked exactly 1,343,237,455 reef-related questions, having to do with lighting, flow, water quality, tank size, fish selection, new products, and pretty much any other reef topic. We are going to continue our series of educational articles, that discuss reefkeeping as a whole. Today, we wanted to discuss making changes to your system. At some point or another, everyone decides that it’s time for a change. 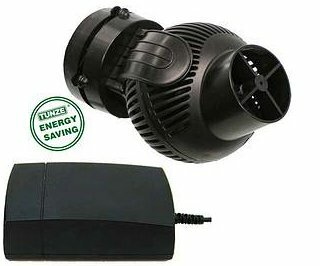 It may be bigger/better/newer lighting, upgraded flow, different bulbs, new skimmer, running GFO, not running GFO, using or not using carbon, switching salt brands, running a calcium reactor, running a kalk reactor, or literally any other significant change. This may be a response to an algae bloom, corals losing color or browning out, decreased polyp extension, or just the desire to improve overall system health. A fundamental principle we want to discuss is the concept of making one change at a time. If you consider all the variables that exist in our systems, regardless of how simple, or complicated we want them to be, you realize that…well….there’s a lot going on. Assuming your system is running and is somewhat stable, any change you perform, will have a corresponding effect on your system. Now, clearly, some changes are more significant than others, but in essence, you are changing a variable in a very large and complex equation (luckily for us, there is not just one right answer to this equations). The reason for suggesting that you only make one change at a time, is the fact that it’s pretty much the only way to draw any educated conclusions from the modification you made to your system. Lets use an example. Lets say that you notice a bit of algae growth in your tank. 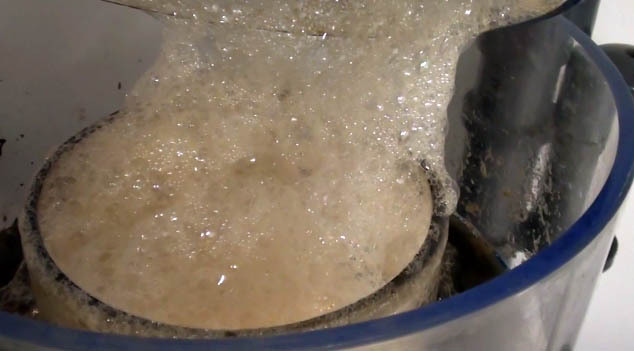 You come to Reef Tools, and read what people are saying in the forum, and you decide that you need a new protein skimmer, you’re going to start running Granulated Feric Oxide, and you’re going to start running bio-pellets and may also dose a nitrate reducer. Now, asides from this being an over-reaction, lets examine why it is a flawed approach. 1. Within a few weeks, you notice that your coral health has deteriorated, you have lost several corals, there is cyanobacteria everywhere in your tank. What can you possibly conclude from this outcome? Did you use too much GFO? not enough? Are the bio-pellets causing a problem in your tank? are they helping? Did the nitrate reducer help, hurt your system? Did you strip everything out of your water? Is the new skimmer working better or worse than the old one? The answer is, that you really know nothing. You have an outcomes, but too many variable to look at, to really know what was the cause for the effect. Maybe 1 or 2 of the changes you made worked, but the other two conflicted with them, and the outcome was bad. You can’t really decide how to proceed from this point. Do you change everything again? Do you stop using one of the new products? which one? Hopefully you see what we’re getting at. 2. The algae growth has been reduced. Now, clearly, this was your goal, but consider the fact that you still have not really learned a valuable lesson from this “experiment.” You really don’t know what effect each change had on your system, and how they interact with each other. You are likely to draw conclusions that are not accurate, and you simply say “this works” or “this doesn’t”. Ok, so now, lets pretend you are in the same scenario, but have chosen to just run GFO (just as an example). You start with the recommended dosage for your system and run it for a few weeks (changing it when needed). Since it’s the only change you made, you can make some inferences from the way your system responds to this change. 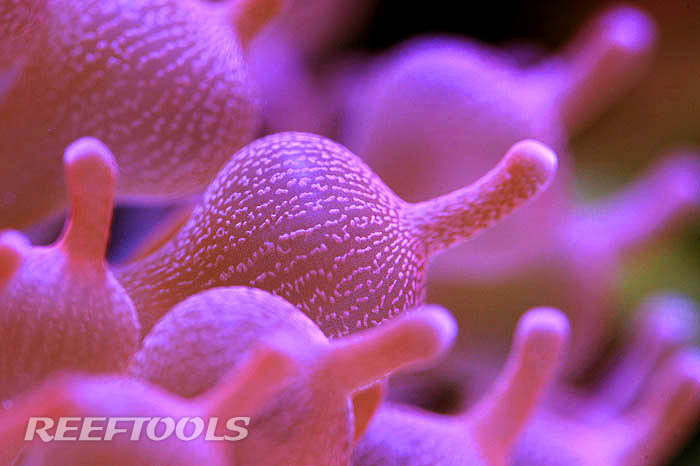 We believe that his is a more effective method at fine-tuning your reef system. We’re interested in hearing what you think, please comment below. 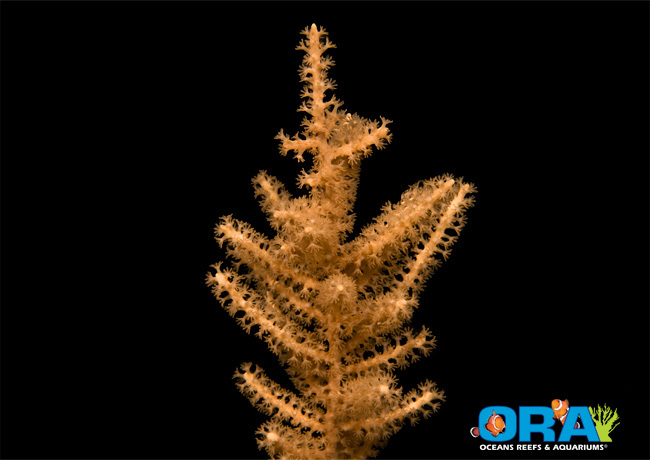 A few days ago, ORA released their latest soft coral, Grube’s Gorgonian (Pinnigorgia flava). Pronounced “Grooba’s”, this octocoral is described as thin-branched and graceful, and having a tan to pink color. ORA original got the coral from Julian Sprung, and have chosen to cultivate it due to it’s hardiness and fast growth. It was originally collected in the Philippines around 1990 by Klaus and Rosalia Grube. From their aquarium in Berlin it has spread all over Europe. So many people have it but don’t know where it came from. I got my colony from the Grubes and grew it for several years into a big bush. I gave a cutting to Peter Wilkens, who took it back to Switzerland and grew it at Wiwi Aquaria. He gave a cutting to Jean Jacques Eckert in France, who still cultivates it in his aquarium. I lost my original colony suddenly about 12 years ago, but was able to get a new cutting from Jean Jacques Eckert during a visit with him for a Récif France conference. I’ve been careful to maintain it now in several tanks. For me this coral is always a reminder of my visit to Berlin where I met Dietrich Stüber and the many wonderful hobbyists there, including Klaus and Rose Grube. Frags of the Grube’s Gorgonian will be approximately 2 inches, and attached to the black ORA frag plugs. ORA recommends moderate flow, with anywhere from low to high lighting. Every year, approximately 70,000 British tourists visit Iceland. 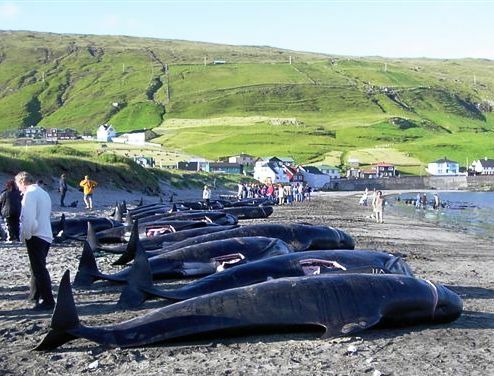 The Foreign Office at Keflavik airport issued a warning informing travelers not to bring home any whale, which would be a violation of International Law protecting endangered species. Stiff penalties of imprisonment or fines of up to £5,000 could be handed out by the courts for violations of these rules. Whale meat is actually on sale at Keflavic airport, as it is only the importing of this meat that would be illegal under the Convention on International Trade of Endangered Species (Cites). It seems that Icelandic whalers have been offering tourists a chance to join them at sea on the hunt, then eat whale meat and blubber. This is ridiculous.